through, please sign my Guest Book on the index page, Through My Window. I am excited to be displaying the work of many fine artist and writers, here, "Through My Window." All work is copyrighted by original artists. I was referred to Rassouli's art site by an Internet friend, and I was amazed at how closely some of his work resembles celestial photos that I have recently published on my site and viewed at the NASA site. His inspirational work does seems to explode and expand from a creative light within and then sometimes recoil and submerge into the spiraled layers of our humanness. 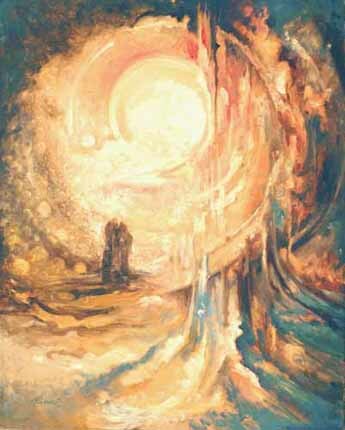 Rassouli's unique features that distinguish his painting technique, he defines as Fusionart. It is a style created and registered by him. "Creation is the product of synchronizing our energy with the universe. Once we experience the whole and recognize it, we become aware that we are nothing but the Divine Creative Force." The following is information taken from his web sites. 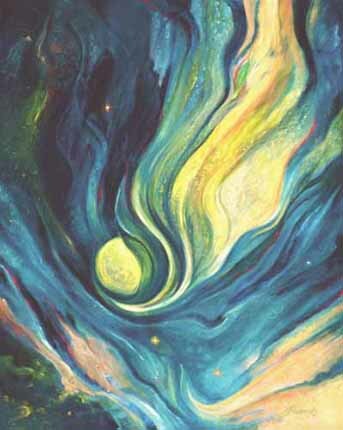 Fusionart's main theme is cosmic unity. The painting style is derived from mysticism, near-eastern spirituality, and a foundation in European painting technology. 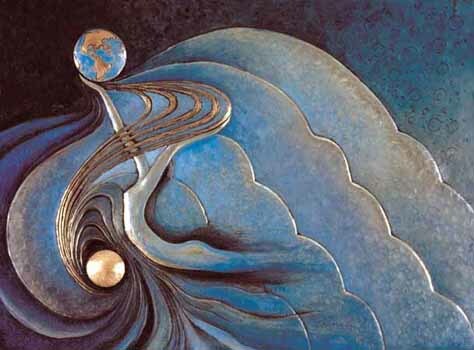 Rassouli represents this concept through illumination of the Divine Creative Light coupled with its manifestation reflected on his canvas in the form of Feminine Beauty. 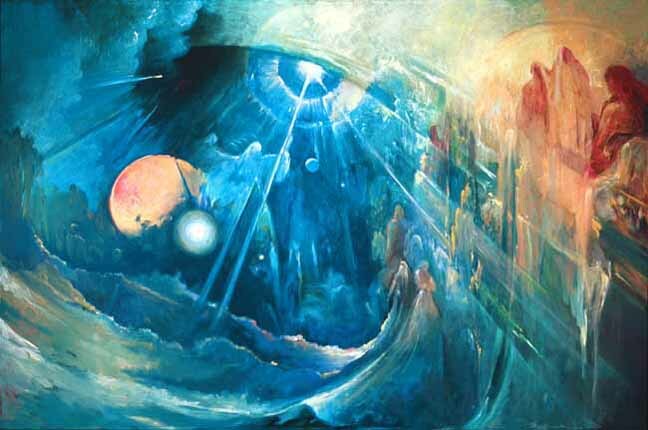 The concept of the Creative Light coupled with the Divine Beauty has evolved in Rassouli since early childhood, and is present in his paintings, relieves and sculptures, book illuminations and murals. He was raised in a historical home decorated with murals and intricate floral designs. Inspired and encouraged by his mystic uncle, Rassouli developed an early appreciation for painting and mystical poetry, and spent endless hours taking lessons from classical and impressionist artists, and studying mysticism. Soon he discovered new ways to transform his subconscious images into forms that he could share with others. "I like to share my feeling of joy and exuberance with others. in their most sensual grace and timelessness." Mural of Angel of Unity, a painting that spans 55 feet tall by 1100 feet wide, is one of Rassouli's latest creations. The angel watches passersby at the corner of Washington Blvd. and the pacific coast in the city of Venice, and has become a Southern California landmark viewed daily by thousands of residents and visitors.